Published: May 14, 2018 at 07:00 p.m. Updated: May 15, 2018 at 07:45 p.m.
Kirk was seen throwing rocks at cars with a friend while attending the Waste Management Phoenix Open at TPC Scottsdale earlier this year, according to the Scottsdale police. Kirk's case is pending. 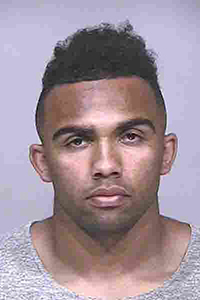 "The suspects were intoxicated and leaving the WMPO," the Scottsdale police told azcentral.com. "As they were walking through a parking lot, security personnel observed them throwing rocks at cars and breaking a window of at least one of them." A Cardinals spokesperson acknowledged to NFL.com Monday that the organization was aware of Kirk's arrest ahead of the draft: "We were aware of this incident prior to the draft. We spoke with Christian about it at length and also looked into it independently. Our understanding is that the process will be resolved in the near future but while it remains an active legal matter, we won't comment further." Cardinals coach Steve Wilsk reiterated Tuesday the team's support of their second-roudn rookie. "We knew about it," Wilks told reporters. "We did our own independent research on it, and we felt very good about the information we received. That's what why we moved forward and drafted him. As I stated before, we want to bring in great character guys, and I think Christian is one of those guys." A Scottsdale native, Kirk was selected by his hometown Cardinals with the 47th overall pick in April's draft. The Texas A&M receiver attended Arizona's rookie minicamp last weekend. In speaking with the media, Kirk touched on how playing so close to home and friends won't distract him from his on-field play. "All my friends that I have with me, that are close to me, know my mission and what I'm trying to do," Kirk told reporters Friday. "They let me be. They're there for encouragement. They're there for me when I need them. They're good. They're never bugging me. They let me go to work and do my business and when it's time for me to go and hang out with them, they're always open-armed." Arizona's first round of OTAs begins Tuesday.